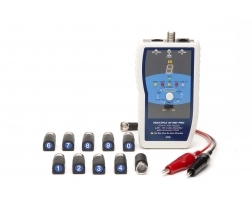 The multiple 10-way PRO combines the functions of a 10-way COAX cable mapper and LAN cables identifier that enables identification of a group of improperly labeled patch cables quickly and effortlessly. It also built-in 2 selectable Net/Tel tones for tracing active Ethernet cables even when connected at a switch or Router and locating live phone line systems. 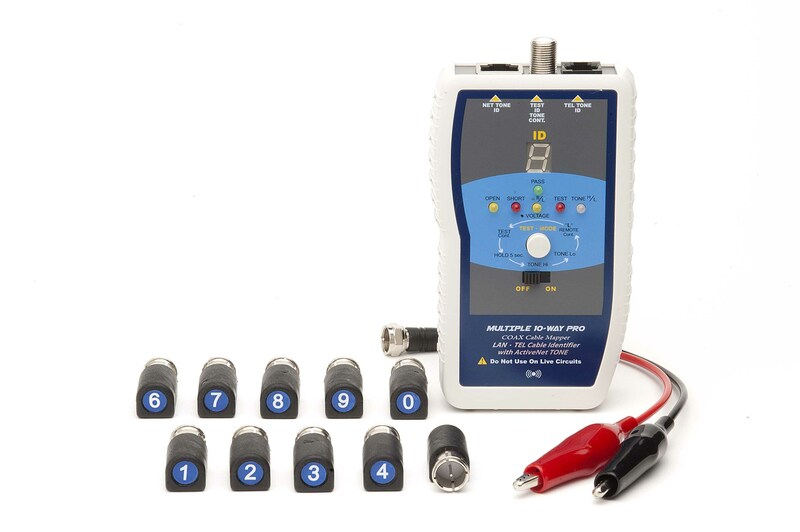 This unit also with the capability to do cable/wires loopback and remote continuity testing and voltage detection and warning on F connector, and auto power off function as well as over voltage protection up to 60VAC in a single unit. It provides 2 different ways of Net Tone and HUB blink (optional) feature to trace and work on a live network. It no needs disconnection cable from switch or server and speed up port identification. Use the number 0 through 9 ID remote terminators allow one person to test and identify up to 10 VDV cables correct location of each office, outlet matching to the patch panel or central office. It also tests COAX cable for proper connection, open or short simultaneously within one trip to the junction box or patch panel. It cut jobs down to a quick task whether you are in the datacom, telecom, Audio/Video, security or electrical field. 1. Locate and identify VDV cables and to test multi-run Coax cable systems. 2. Map and trace up to 10 Coax, speaker or security/alarm cables at a time. 3. Trace live Ethernet Cable/Outlet to a switch and locate live phone line systems. 4. Perform both loopback continuity testing and remote continuity for wires identifying and labeling. 5. Provides 2 efficient way of Net Tone & HUB blink (optional) to trace and signal on a live network. · Single one button operation and map up 10 cables with just one single trip. · Remote ID numbered 0 through 9 for fast and accurate identification. · Tests and identifies Coax cable continuity for proper connection, open and short. · Generates powerful Net tone for tracing STP cables and active Ethernet cable at a switch. · Outputs Tel tone for easily locating target line in live telephone line systems. · Loopback continuity check displayed via a lit “SHORT” LED with the use of include clips adapter. 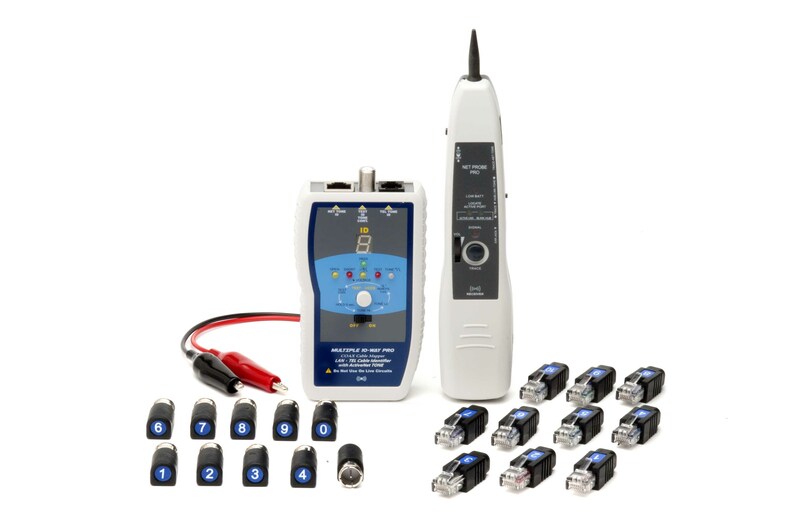 · Remote cable/wires continuity testing with the use of optional remote LED clips adapter. 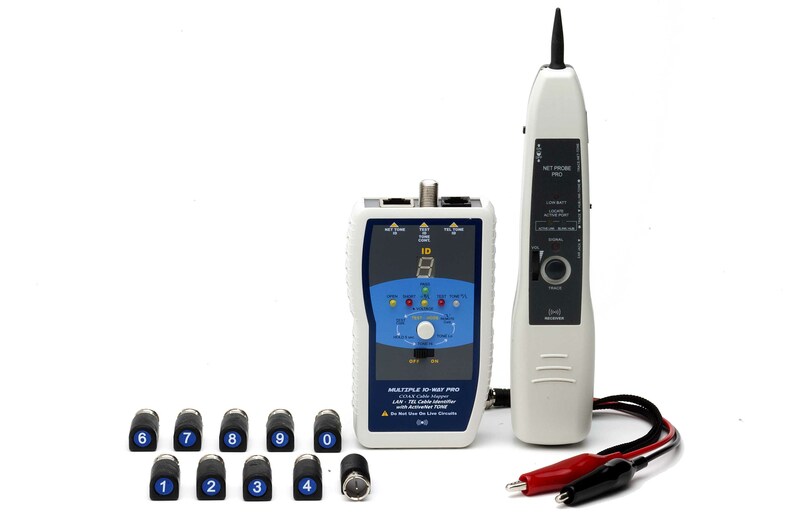 · Optional Net Probe PRO (PR-06PRO) with HUB blink mode allows locating an active Ethernet outlet and identifying the link port on a HUB, Switch or Router and with flashlight for dark field.